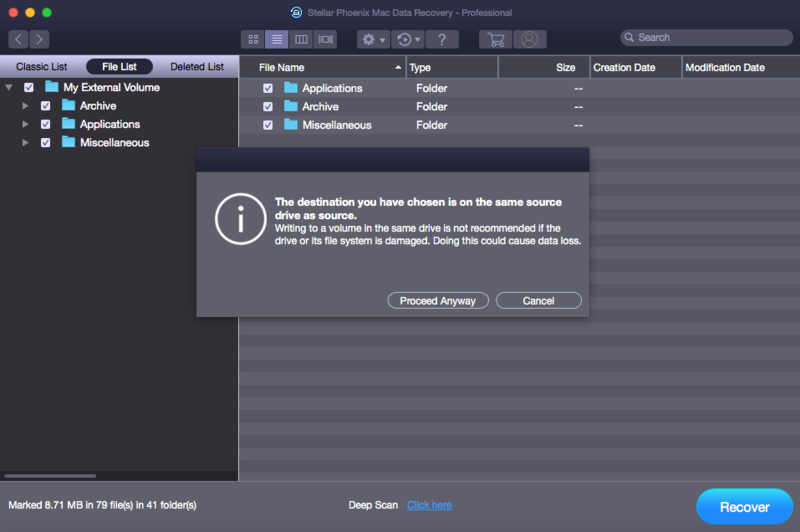 Stellar Phoenix Mac Data Recovery gives message "The destination you have chosen is on the same source drive as source"? The messages generated by the Stellar Phoenix Mac Data Recovery software while you press the Recover button are just a precautionary messages. They don't mean any harm to your files or the data recovery process. Resolving messages displayed by Stellar Phoenix Mac data recovery below. There are two possible scenarios for this issue. Case 1: "Source and destination volume are same"
This message will prompt when data recovered from a volume is being saved to the same volume. E.g: In below screenshot, Macintosh hard disc was scanned for deleted files & same location was chosen to save the recovered files. Hence, the below message appeared. To overcome this message, always choose a different volume to save recovered files. Case 2: "The destination you have chosen is on the same source drive as source"
This message only warns that the volume scanned for deleted files and another volume chosen to save recovered files lies on the same hard drive. You can simply click the "Proceed Anyway" button to ignore this message. Important Tip: Always ensure an external device, which is larger than the source media to save your recovered data. In case you don't have any external media then chose a different volume to save recovered files. If you have an external media then kindly format it once after backing up all the data from it and then try to save the files on that formatted external media. 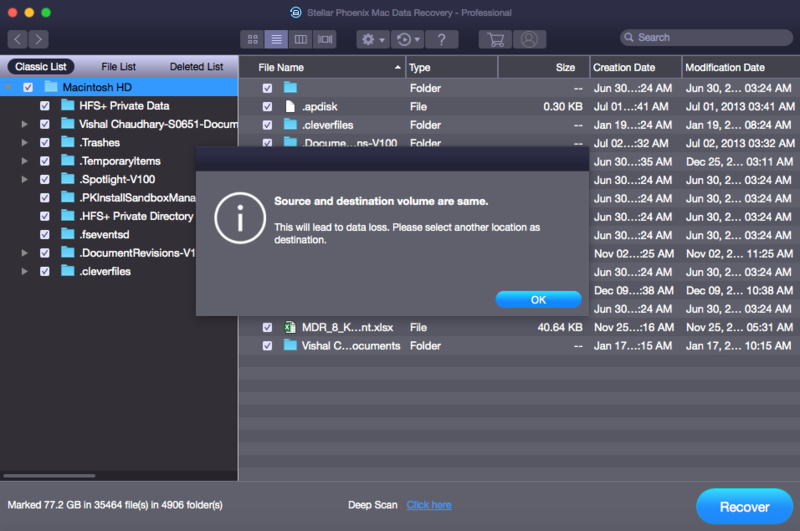 Please follow simple sequential steps to save recovered files with Stellar Phoenix Mac Data Recovery. 1) Once scans finishes, select files and click Recover button. 2) 'Open Directory' window appears. From left pane, select a destination to save recovered files. 3) Once destination is selected, Click 'Choose' and again click 'Proceed Anyway'. 4) The Save process begins and files are saved at chosen destination.